I’ve partnered with Word Entertainment for this sponsored review. All opinions are my own. Today, the hearts of Southern Californian residents are hurting. We are saddened by the news that on Thursday morning an active shooter took 12 lives at the Borderline Bar & Grill in Thousand Oaks. Later on that day, we learned that residents in Ventura County were grappling with a wildfire that had just broken out. As of today, The Woolsey Fire has exploded to 14,000 acres in Los Angeles and Ventura counties, and fire officials say the relentless blaze is continuing to grow. Southern Californians have a reason to fear and it is normal. Fear is an emotion that protects us from the threats in our surroundings. Furthermore, the majority of us are fearful of the same things including the fear of failure, the fear of the unknown and the fear of being alone. 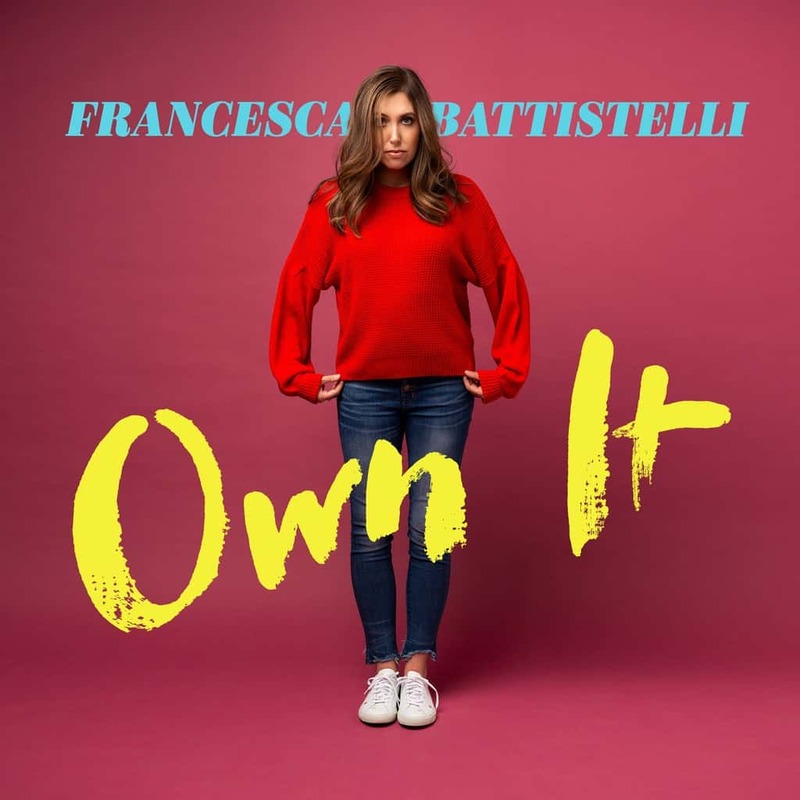 Christian Recording Artist, Francesca Battistelli, shares a meaningful message of hope for those of us who suffer in fear, in her new album titled Own It released nationwide on October 26. Own It is the follow-up to Battistelli’s 2014 GRAMMY®-nominated album If We’re Honest featuring the GRAMMY-winning song “Holy Spirit.” I personally own both albums and love them equally. The first time I heard the “The Breakup Song”, I was sitting in my car listening to the radio and worrying about where my son would go to school next year. Based upon his unique needs, I didn’t know where to look or even where to start. That’s when the words of “The Breakup Song” touched my heart. Last Sunday, I had the privilege of attending an André Rieu concert at the Microsoft Theater in Los Angeles. As a connoisseur of classical music, I looked forward to hearing the sweet sounds of the Dutch violinist and his waltz-playing Johann Strauss Orchestra. An André Rieu concert is part music, part comedy and part entertainment. From the operatic voices of the soloists, to the melodic sounds of the soothing strings, to the comical interactions between Andre and his orchestra, an André Rieu concert appeals to all ages. 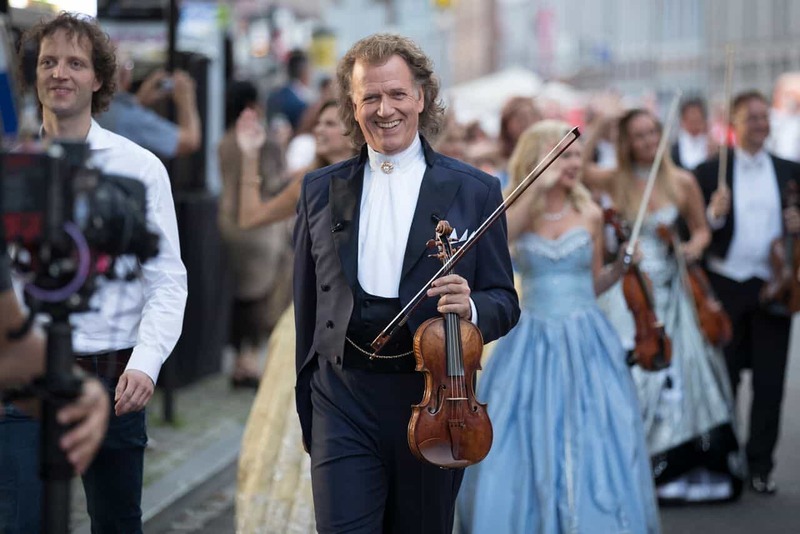 André Rieu, also known as “The King of the Waltz,” is one of the best-selling classical musicians of all time, and one of the most popular musicians in Europe. He has sold over 40 million CDs and DVDs and notched 30 No. 1 chart positions worldwide. As leader of his own Johann Strauss Orchestra, the largest private orchestra in the world with 60 members, Rieu has played for more than 15 million people. Over the years, his concerts have featured Mary Poppins flying over the audience, the sweet accompaniment of the Soweto Gospel Choir, and special guests like Jermaine Jackson and Sir Anthony Hopkins. 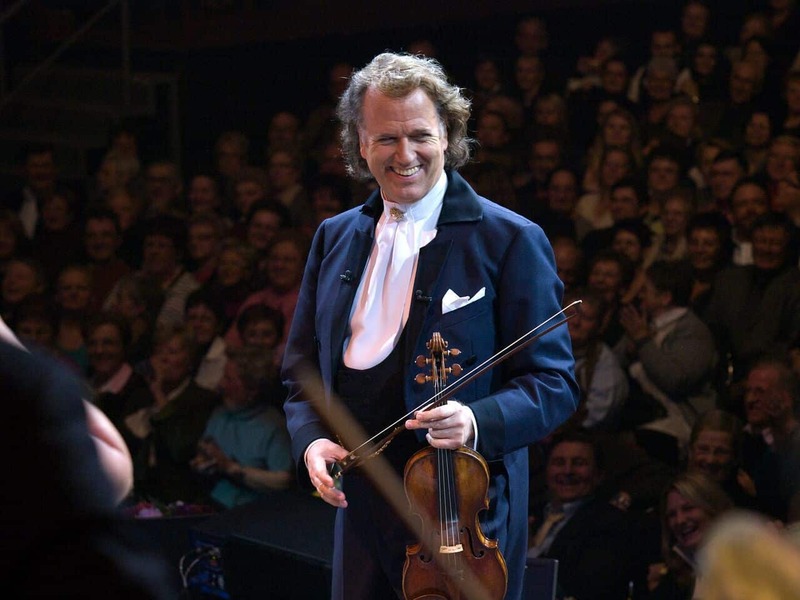 During his concerts, Rieu likes to make jokes, tell stories, and even indulge in a bit of slapstick comedy in between performing some of the most beautiful waltzes in the world, along with hits from musicals and films, and beloved popular and romantic songs from all decades. Whether you’re looking to download some free music to listen to while in your car or exercising at the gym or simply relaxing outdoors, then Amazon should be your first stop. 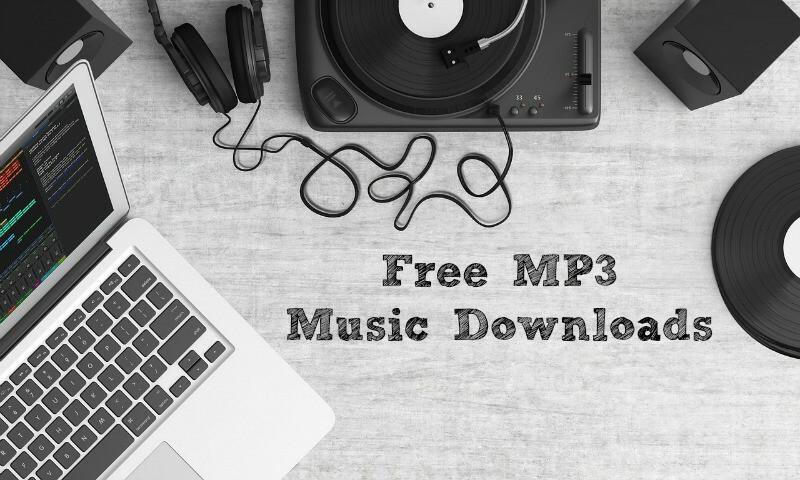 When you go to download free music on Amazon, you’ll find hundreds of songs that range from traditional to contemporary in style. Whether you like jazz, pop, classical or reggae there is bound to be something for everyone. Furthermore, downloading free music on Amazon is completely legal, because they have permission direct from the artists. The availability of free music on Amazon changes daily. So, here’s a guide as to how find and download free music on Amazon. I am a product of the early 90’s. So is Seal. Ever since he came on the music scene with his Top 10 hit ‘Kiss From A Rose’, I have been a fan. His beautiful, yet raspy like voice, serenades the listener to a higher plane. Seal’s newest album ‘7’ is no different. It reminds me of his past R&B style albums. Hence, ‘7’ is a return to the Seal of the nineties when he created polished albums with high quality tracks from start to finish. Seal explores all the ups and downs, the nuances and every aspect of love in ‘7’. ‘Every Time I’m With You’ personally triggered a memory for me of when I was in a past relationship, but the feelings were not mutual. Back and forth we went for years in a roller coaster of emotions, until finally I pulled the plug. That’s how much I relate to the lyrics of the song. Thankfully ‘Life on the Dancefloor’, picks up the tempo a bit more and reminds me of kicking off my shoes and dancing with my now husband of 13 years at my wedding. The upbeat rhythm is just enough to inspire you to dance, but not too intense that you want to sit it out! It is the best moment on the album. Seal’s ‘7’ is available now nationwide on Warner Bros records. It is one album you will definitely want to download and ponder. I live in a part of California where there are bunnies bouncing everywhere in Spring. So when Disney’s Hop To The Music Collection arrived in the mail, it was the perfect opportunity for our family to turn on some music and hop to the beat! All of Disney’s Hop to the Music titles are great items to include in Easter baskets. Typically, for Easter I only put in one item and a chocolate bunny. I don’t go all loco around Easter, because I believe the emphasis should be on the true meaning itself. Therefore, Disney’s Hop To The Music Collection is a happy medium. The music will get your kids up and moving instead of devouring loads of candy and having a sugar high afterwards! 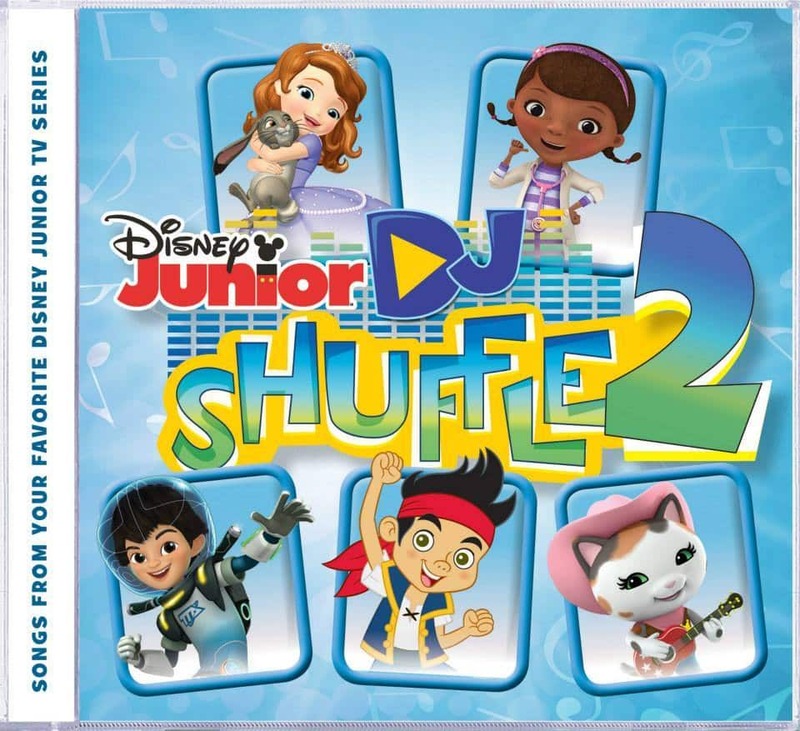 Because we are big Disney Junior fans in our house, DJ Shuffle 2 was naturally our favorite CD in the series. As we were driving around in the car listening to it, my kids came up with their own “Guess what Disney Junior show this song is from?” game. It was cute to listen to them spew out different answer. Most of the time they were right too! Our family owns the movie Frozen and Field Trip Girl often plays with her Elsa and Anna dolls. So it was nice add the music CD Frozen The Songs to our Disney collection. Frozen The Songs is chopped full of all the classic Disney songs that spin around in your head when you think of the movie. 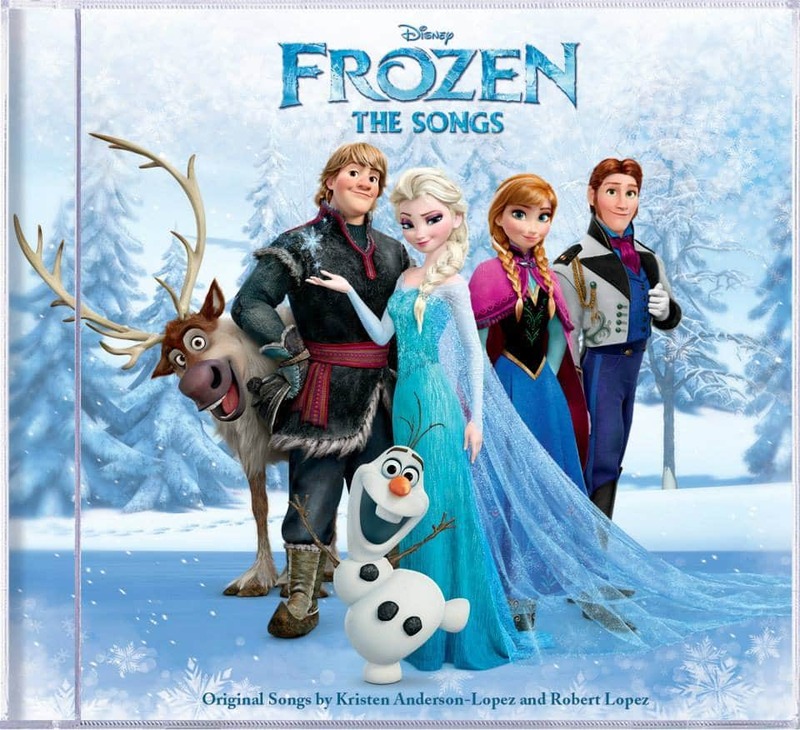 From Let It Go to Do You Want to Build a Snowman to For The First Time in Forever, Frozen The Songs is bound to be a repeat play in our collection too. My family loves musicals! We have enjoyed several of Disney’s Broadway musical productions such as Beauty and The Beast and The Lion King. So after Field Trip Boy and I listened to Into The Woods Deluxe Edition CD, we were hoping that Disney turns this wonderful movie into a Broadway show. 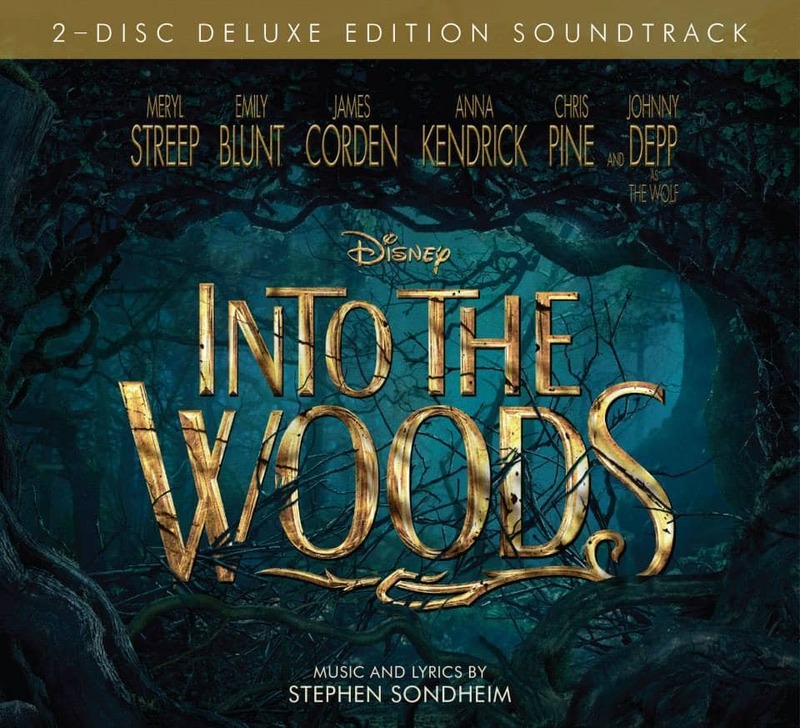 Into the Woods Deluxe Edition features 20 songs from the film and the score, which includes songs from the original stage musical, ‘Finale/Children Will Listen,’ ‘Giants in the Sky,’ ‘On the Steps of the Palace,’ ‘No One Is Alone’ and ‘Agony,’ among others. Deal alert! If you purchase Into The Woods Deluxe Edition on Amazon you get a FREE MP3 version of this album. This Thursday I plan on taking Field Trip Boy to see Marvel Universe LIVE! at the Honda Center in Anaheim. He is super excited and so am I! And guess what I will be playing while driving there? 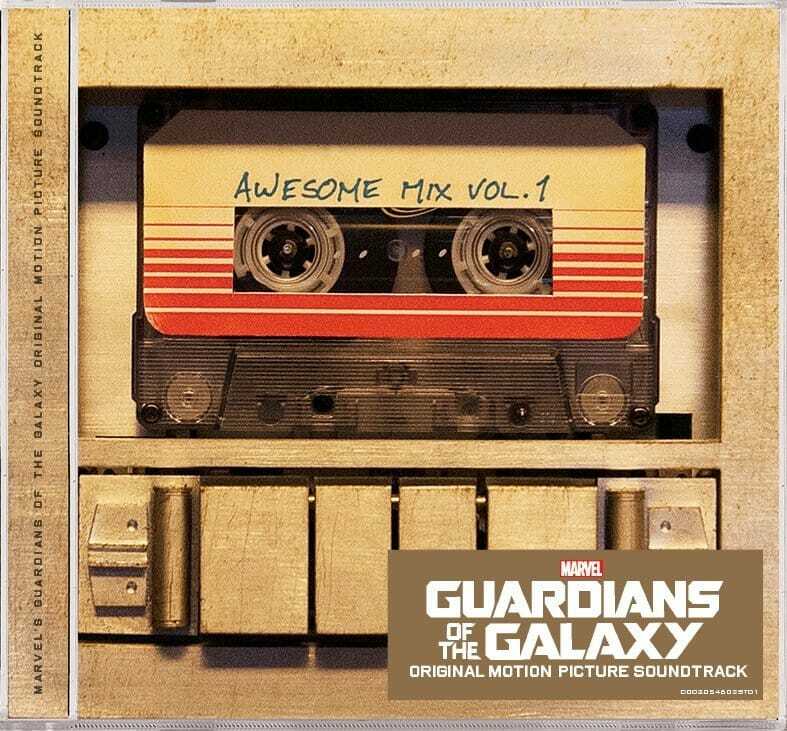 Marvel’s Guardians of the Galaxy Awesome Mix Vol. 1. Bonus deal! If you purchase Guardians of the Galaxy Awesome Mix Vol. 1 on Amazon you will receive a FREE MP3 version of the album. Now it’s your turn to enjoy all of this great music! 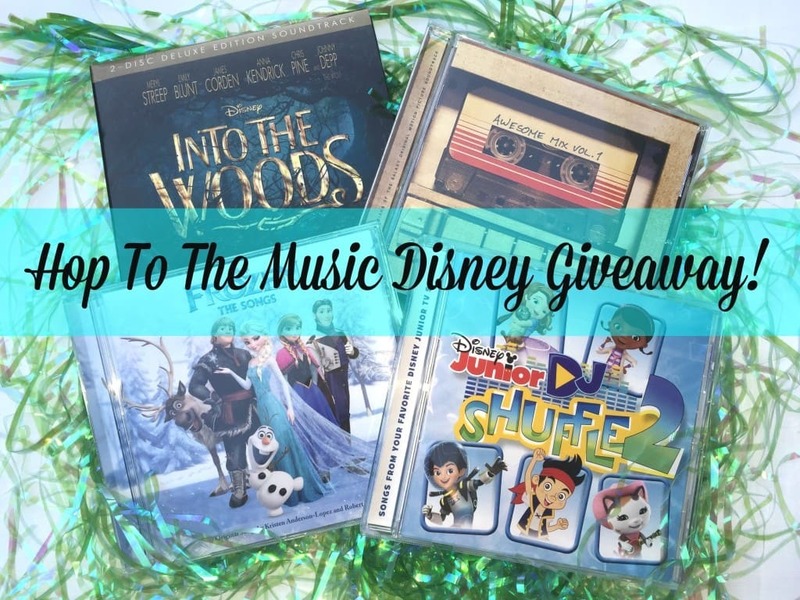 Enter to win your very own Disney’s Hop To The Music pack! Rules: US Residents Only. No purchase necessary to enter. One winner will be randomly selected via RaffleCopter and notified via email. Winner must respond within 48 hours to claim the prize or a new winner will be chosen via RaffleCopter. The prize package will be fulfilled by the sponsor and arrive within 4-6 weeks after being selected. All of this fantastic Disney music can be found in the new Disney Music Emporium. Disclosure: All photos copyrighted and used by permission from Walt Disney Records. All points of view are my own.